Another National Progressive production after their success with "Poribartan". Song#BJ1 is basically a traditional Bengali song, known as a Tarja gaan. Only record ever released had song#BJ2 & BJ3. A recently released VCD of this film contains a full and uncut BJ1 and only parts of BJ2 and BJ3. "shimul shimul shimulti" is an amazing composition with totally different melody and thythm in each antara. One can hear traces of other folk songs (obviously Salil's IPTA influence) in this song. 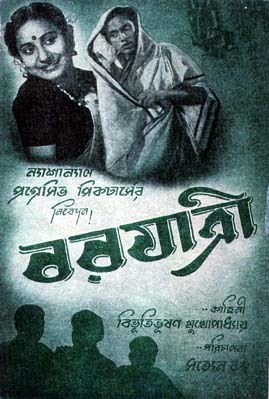 In fact one can see how Salil started his own unique style as early as 1951. He just "invented" his own style - totally different to what the other traditional composers were doing at that time. "roop nagarer pothik ogo" is also a haunting song with beautiful melody and has been my favourite for many years. It is also interesting to see the name of Gurudas Pal as a lyricist - I think for that Tarja song - "puntimaachh daangaay uithyaa foot kaatey". Gurudas Pal was quite well known in IPTA as a song writer and a composer. Salil had great respect for him and has often talked about him in his interviews.Refer to "A Few moments with Salil Chowdhury" .